No doubt a person’s attitude in the face of trials reveals his loyalty to Allah and whether he has sincere love for Allah. If a person has a genuine love of Allah and willingly remains resigned to what He creates for him, he will display the best of attitude towards everything that comes from Him. A person who displays moral perfection even in the face of the hardest trials, and shows submission and perseverance no doubt loves Allah very much and is devoted to Him by heart. On the other hand, it is another fact that Muslims grow mature by means of trials, attain profoundity in their fear of Allah and get ready for Paradise. No matter with what kind of hardship they may encounter, they attain the morality of people in Paradise by displaying a strong personality, never despairing when faced with hardship, meeting every test with putting trust in Allah and never boasting or displaying a spoiled character because they enjoy a lot of blessings. This beautiful character make them deserve Paradise, a place of glory and perfection that Allah creates with His infinite knowledge for His servants. having bad adab is *incompatible* with Islam and having good adab is a *prerequisite* to being a good, practicing Muslim. In other words, if you consider yourself a believer, a practitioner, and a follower of Islam and of the Beloved ﷺ who came to “perfect character” you CANNOT continuously have bad adab with others with impunity. Having bad adab is UGLY and there is NO room for it in our beautiful tradition. Period. Furthermore, don’t forget that Allah ﷻ sees everything you do, knows well what is in your heart, AND it is ALL being recorded; every foul word, every eye roll, every whisper, every cold shoulder, every rude comment and act, every interruption, every dismissive retort, every insult or slight, etc. Sooner or later it will catch up to you, and that’s NOT a good thing, a`uthubillah! May Allah ﷻ guide us, forgive us, and increase us all in adab. Amīn. Why should we be kind? The most important reason is because Allah is kind and enjoins kindness on us. Another reason is because our Prophet (peace be upon him) was kind, and we are asked to model ourselves on him. It’s one thing to know we should be kind, but what specific instructions does the Quran give us for living in kindness? Don’t give away what Allah has given you for your own sustenance, but do what you can for the needy, and do so with gladness. Needy people have feelings. Charity done in a spirit of resentment or superiority is dead charity. Give your charity life— be sincerely nice to the people to whom you’re giving. Yes, be kind and just with your parents, even if they’re bad parents or want you to commit shirk! Be as kind to them as you can be while being a wholehearted slave of Allah. Don’t rely on your feelings alone. Do you secretly have a favourite friend? Child? Sibling? Teacher? Don’t use your feelings as an excuse to freeze out the others. Be kind to leaders, no matter how foolish they may be. Yes, Musa was instructed to speak gently to Pharoah, a man who couldn’t have been more wrongheaded. Get with the Quran’s program! Take time to examine your relationships with others and root out any behaviours that smack of unkindness. – Surround yourself with Muslims who practice the Deen. They are your only True Friends in this Life and in the Hereafter. – Not everybody is out there to judge you, there are some who want the best for you and want to help you get into Al-Jannah, value them. – Indeed, a friend who doesn’t care about your Aakhirāh is not really your friend. – Sometimes the hardest person for you to correct is yourself. There is no shame in being wrong, the shame is in choosing to stay on the wrong path. – Whatever takes you NEAR to Allah, takes you AWAY from Hellfire. Whatever takes you AWAY from Allah, takes you CLOSER to Hellfire. – We all take tomorrow for granted because we believe tomorrow will always be there. Tomorrow may be there, but we may not! – Who said “TOMORROW” is guaranteed? Make the use of “TODAY” that you are blessed with! Yesterday many thought that they would see today, and today many will think they will see tomorrow. Death could be tonight, in the next hour, the next second, yet we live as if we still have so many years to live. – You may be rich, famous or have a high status in this dunyah, but to the Angel of Death, you’re just another name on the list. – One day you’ll just be a memory for people, and a lesson to others. Do everything you can to please Allah, be a positive lesson. – Imagine how many people were here with us last year, but are no longer here again! Even our turn is soon approaching. May Allah forgive us and forgive them. – You look for the latest fashion and designer clothes, but don’t forget O’ Son of Adam! You will end up being wrapped up in just a white shroud. – Live to please the Creator, not the creation. If Allah is happy with us, what more can we ask for? – It’s sad how we begin to appreciate blessings, either materialistic things or good people; only after we lose them. When it’s too late! Do we really invest to be like them? – You wouldn’t throw away a diamond to pick up a rock, so in the same way, don’t throw away the Aakhirah (Paradise) by chasing the Dunya (worldly). – How do you expect to get Al-Jannah when you haven’t worked for it in Dunya? That’s like expecting to pass an exam you never took a class for. – We live in a time where people give up certain foods in fear of becoming overweight, but cannot give up sins in fear of Allah! – For a believer — you may be penniless, homeless, unemployed, sick and feel like you have nothing. But you have the One thing that money can’t buy: “Allah”. – Allāh knows what you want, what you need, what you deserve, at what time and what place, trust Him and His decisions (is best for HIS creation), He knows while you don’t. – If a celebrity mentioned your name to the world, how happy would you be? Mention Allah in a gathering, and He mentions you to the angels! – And, make the Qur’an your companion and a part of your life. Don’t let yourself become a stranger to it. The Qur’an is like a friend, the longer the friendship lasts the more you will know of its secrets. – Don’t praise me because I’m on my Deen, but pray for me because I have faults which you have not seen. ُ”Truly, Allah loves those who repent, and He loves those who cleanse themselves.” [Al-Quran 2:222]. May Allah purify our hearts. And peace and blessings of Allah be upon our noble Messenger of Allah, Muhammad and his household. Ameen. When a Muslimah hears that it is Haram to put her personal picture as a PROFILE PICTURE on facebook She gives this argument: ”but this is me! “First of all, when you put your picture as a profile picture on Facebook you are causing Fitnah to your brothers in Islam because you don’t help them to lower their gaze even if you are wearing your Hijab in that picture. In the street you suppose to lower your gaze as they (Muslim men) are suppose to lower theirs. But on internet, it’s different! Because any boy would feel that he is free to look to your picture as he wants, the moment he wants because you are showing it to the whole world, So sister! How can you let any stranger’s glances travel over your face, eyes, lips, etc.? how can you let his eyes eating your body like that? Any men on Facebook would thinks it is his right to look to the picture you are displaying in front of him forgetting that Allāh is watching him. He is disobeying Allāh of course, but think! Who led him to this disobedience? You know that feeling, don’t you? You open your inbox and this one email stands out like it’s emitting a toxic vibe of its own or something. So you read it, and yup, it’s confirmed, that same person who should be busy drowning in his or her endless array of mistakes is actually taking out their anger on YOU! Blaming, insulting, putting you down, or just bullying you into doing something exactly how they think should be done. I apologize for the misunderstanding, but I do have a quick question that would help resolve the current problem in a timely manner: ARE YOU ALWAYS SUCH A MORON OR IS TODAY A SPECIAL OCCASION???? Why Can’t We ‘Cage’ The Rage? I don’t want to cut us too much slack, but honestly, it’s a little bit understandable why it’s so easy to lose your temper in this ‘all-digital’ day and age. According to Mehrabian’s Theory, effective communication of emotions is only 7% related to the words used, 38% the tone of voice, and 55% body language. A wife ends the conversation with ‘fine’ (a supposedly pleasant word) yet the husband will most probably get a bit scared! Why? Because the implied meaning of the word is totally different! There’s a great deal of intimidation in the way she glares at him, or the way she suddenly starts whisking the eggs so vigorously like she’s having a seizure. There’s so much you can tell from a person’s pitch, attitude, or facial expression. And now, based on this breakdown, since it’s all in that 7 % of words used, a whopping 93% of the feelings conveyed in an email or text message are lost and can be completely misunderstood. Problems are bound to escalate when we start filling in those percentage blanks with assumptions, preconceived impressions, and dramatic sound effects! We all do it on some level in real life, too. A driver cuts you off on the road, or a waiter brings you mashed potatoes instead of fries and you just hulk out on them while someone else might simply say ‘it’s no big deal’. The same thing that makes me angry could be something that you easily let slide by. Why is that? A friend might read the same angry email and say ‘give them the benefit of the doubt, maybe they have a point’ and so in addition to being ‘over the rooftop furious’ you’re suddenly consumed with thoughts of finding a shovel to bury your friend in the backyard. Alive! Now you know me. I’m the ‘Why’ girl. I need to know why things happen the way they do, and what goes on inside people’s heads. So naturally, I’m gonna take you back to basics; the inner core of human psychology. Integrity: A.K.A the most honorable type of anger, which is probably the only ‘healthy’ type, when we’re angered by injustice, oppression or a breach of trust or morality. Anger that has a beneficial goal is usually automatically controlled and directed towards the right purpose. Fear: Yes you read that right. We get angry when a weakness is triggered and we’re afraid someone might see it, so we mask it with anger. Pain: You could be sad, lonely, worried, hurt, frustrated or tired, yet use anger as a substitute emotion because the truth is, it feels better to be angry than to face emotional pain. Insecurity: If anger makes us feel in control then we’ll never be motivated to control our anger. It’s sometimes used as a self-defense mechanism to regain power; or more accurately, the ‘illusion’ of power. Fortunately, the first type of anger can be very productive, especially when it compels you to speak up against injustice or uphold your morals. An angry email dripping of discrimination or oppression is seldom something we can just let ‘slide by’. If that’s the case, then by all means, please be angry. Stand up for your beliefs, morals, rights and the rights of others. History proves that healthy anger has conquered racism, dictatorship, and abusive slavery. But now the tricky part is, ‘Anger’ is the King of ‘Hide and Seek’; it’s so good at hiding your real emotions away and tricking you into seeking aggressive reactions instead. It’s not always a matter of ‘righteousness’; sometimes it’s plain ‘egotism’. For example, you could immediately get enraged by a harsh-worded email from your boss because deep down perhaps you’re worried he’s implying you’re not good enough, and you unconsciously believe being infuriated is better for your ego than facing your fear. It makes you feel bigger and more in control of the situation. In other words, anger is triggered according to our own personality traits and self-esteem. A competitive person might get infuriated a lot easier in ‘win and lose’ incidents than someone who isn’t. I could give you more examples, but you get what I’m trying to say, right? Sometimes the anger is a reflection of an inner problem, and our angry responses are just personal assessments of emotional situations, which is what psychologists refer to as ‘cognitive appraisals’. The over-analytical psychopathology won’t help when you’re reading an angry message or email where the antagonism is so palpable and the ill-willed vibe is so vivid you could cut it with a knife! It’s usually involuntary, too, for the more you read, the more your nostrils flare up, your veins pop out and your blood boils like lava. In that case, we obviously need a new game plan. Forget the ‘why’ for now and let’s look at the ‘how’. Here are the golden rules. Memorize them. They’ll save you from a lot of very ugly scenes in the future, trust me! Never reply to an angry message or email on the spot. Step away from the keyboard and take your time. Can you breathe? If yes, then please take a few deep, cleansing breaths. If not, then proceed to step 3. When anger reaches a certain boiling point, it’s too late to go back. So go take it out alone in a safe environment. Write your angry response down on a piece of paper. Go for a walk, punch an innocent pillow, scream or cry it out. Whatever works as long as it doesn’t harm you or anyone else. Come back and read the email again. Check your emotions. Are you still angry? If the answer is yes, then please repeat step 3. Take all the time you need. That’s the good thing about digital interactions, there’s no rush, you can respond whenever it’s convenient for you. Now that you have a clear mind, read the email again, being mindful of the ‘cognitive appraisals’ we’ve talked about earlier. Is it really so bad? Are you reading too much into it? If you’re still apprehensive about the whole thing, then cut down to the chase and request a face-to-face meeting or even a phone call. One of the main secrets to effective communication is sharing your feelings, and fulfilling the need to be heard and understood. b) Explain your side as briefly as possible, without making your opinion sound like a given fact. c) Don’t hit the ‘reply-all’ button until you’ve tried to resolve the matter privately first. It takes the heat off the ‘ego game’ and is certainly much more professional. d) Always, always, ALWAYS end your message on a positive note. The ending is what we all remember the most; it’s what makes a good book, a good vacation or a good argument. Always end your email with a few pleasant words. e) Proving you’re right isn’t all that satisfying if it costs you your peace. Look at the bigger picture, and try to reach a middle ground. Ummmm definitely NOT! It makes you mature and wise and smart. It makes you a real professional. It builds you a solid ‘sterling’ reputation and it’s everything you need to invest in good, healthy, long-lasting relationships. 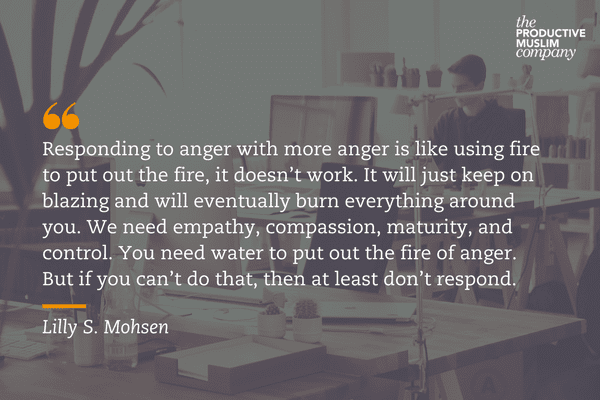 Responding to anger with more anger is like using fire to put out the fire, it doesn’t work. It will just keep on blazing and will eventually burn everything around you. We need empathy, compassion, maturity, and control. You need water to put out the fire of anger. But if you can’t do that, then at least don’t respond. Follow our beloved Prophet’s advice and stay silent when you’re mad. Sleep on it and wait for the storm to pass by. The fire won’t burn forever; it will eventually turn to ashes. Deep down you already know that. It’s the ‘swallow your pride’ part that we all have problems with. Just remember, rage will never make you extraordinary, but intelligent patience will. Oh, it so always will…. Islaam commands the parents to take care of their children and to bring them up according to Islamic manners. Allah, the Almighty, has entrusted parents with their children. Therefore, parents bear the responsibility to raise up their children in the Islamic way. If they do so, they will be, Allah Willing, blessed in this life and the Hereafter. If they don’t, they may see the bad results of it during their life, and Allah forbid, in the Hereafter. The Prophet, Sallallahu alaihi wa sallam, did not excuse anyone from a responsibility that Allah (the Almighty) has put on an individual. The ruler is responsible, the man and woman are responsible… all within their capabilities, domains, and authorities. Sadly, the loss of true Islaam from our Muslim Ummah these days is nothing but a result of the neglect of this responsibility. Men and women, fathers and mothers, share the responsibility to raise, educate, and build the new generation in the correct method and the right way. The protection of yourself and your family from Hell-Fire can be done by good Islamic education, the practice of good morals and nobility. 1-Show your child the value of good deeds and their affect on the individuals and society. Also demonstrating the effects of bad deeds, while taking into account the child’s capability of understanding. 2-Parents should be a good example in their behavior because children like to imitate their parents in their words and actions. 4-Treat your children lovingly and kindly. The Prophet (Sallallahu alaihi wa sallam,) taught us this practically. 6-Encourage your child’s sense of belonging to the Muslim Ummah, by teaching him/her the importance of brotherhood and sisterhood between Muslims. Teaching your child to care for the Muslims, be they from or in any land. Make him/her feel like they are apart of the Muslim body; to feel joy when Muslims are joyous, to feel sad for Muslims’ sadness, and to do their best to achieve the Muslim Ummah’s goals. A- Take children to Masaajid and introduce them to their brothers/sisters in Islaam regardless of race, language, or origin. B- Teach children the history of the Prophet, peace and blessings be upon him, his Companions and the history of the Prophets. Keeping in mind the child’s capability of understanding. C- Encourage children to sympathize with Muslims and to contribute to the solutions Muslims face, such as poverty by donating some money to poor Muslim children. D- Take part in celebrations, picnics and festivals with Muslims, especially with children of the same age. E- Imbue in children the feeling of love for Allah, His Prophets, Muslims, and righteous deeds. This love, Allah Willing, will lead to special behavior towards and for all those loved. The above are general guidelines which will hopefully help parents accomplish the job entrusted to them by Allah Almighty and His Messenger (peace be upon him).